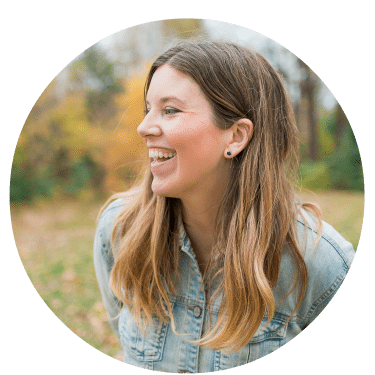 A reminder: I’m participating in the ‘One Room Challenge’ (ORC), hosted by Linda from Calling It Home, that challenges home and design bloggers to make over a room in their house from start to finish in 6 weeks. We have decided to tackle our master bedroom and created an IKEA pax hack. 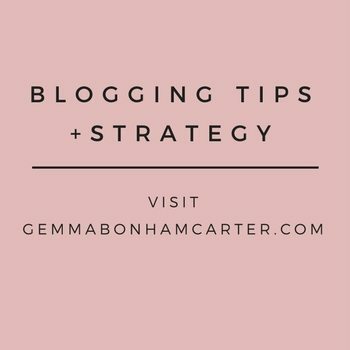 Here’s what you missed: The Before and Design plans, Painting Furniture and Doors, Big Art with Engineer Prints, and How to Create a Bedroom Reading Corner. 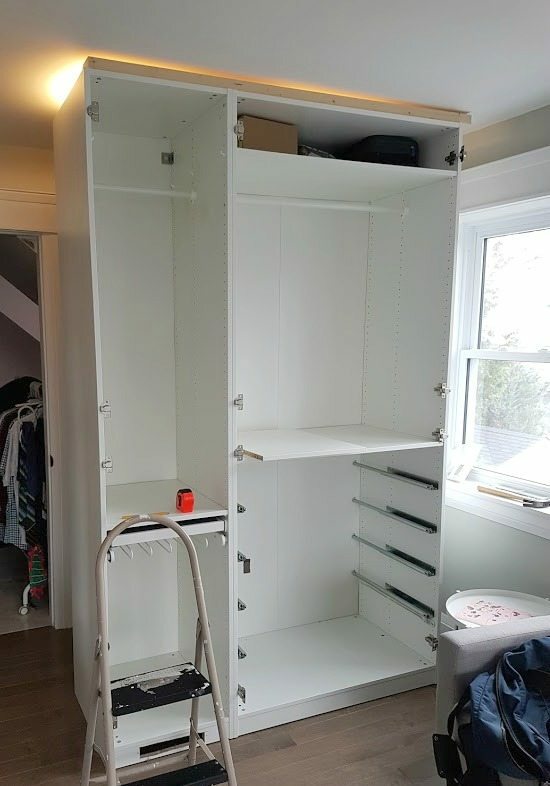 This week I’m happy to report that we finally finished up our IKEA Pax Hack, creating a custom looking wardrobe. It was the biggest project in this room, but WELL worth it. A Purdy microfiber mini-roller – These are unbelievably good – no brush marks! New hardware makes your wardrobe look amazing. I especially love how these long gold pulls look with the Pax wardrobe. Here is a reminder of what this corner was looking like before. The Pax wardrobe stuck out like a sore thumb – like a piece of furniture that had just been dropped in the corner of the room. I knew that I wanted to build it in so that there weren’t any gaps between it and the walls, and also wanted to paint it out the same colour as the walls so it looked seamless. 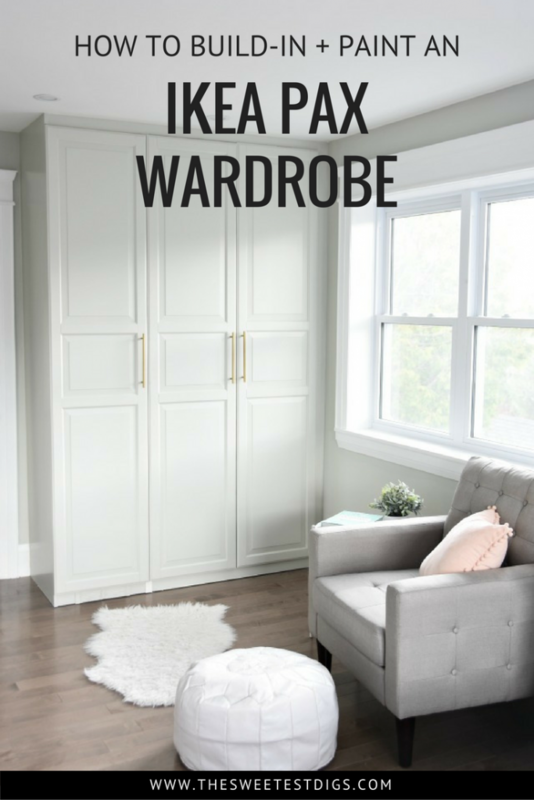 The first step to customizing the wardrobe like this is to pull it out from the wall and cut out the baseboard. This means you can snugly get your Pax up against the wall. 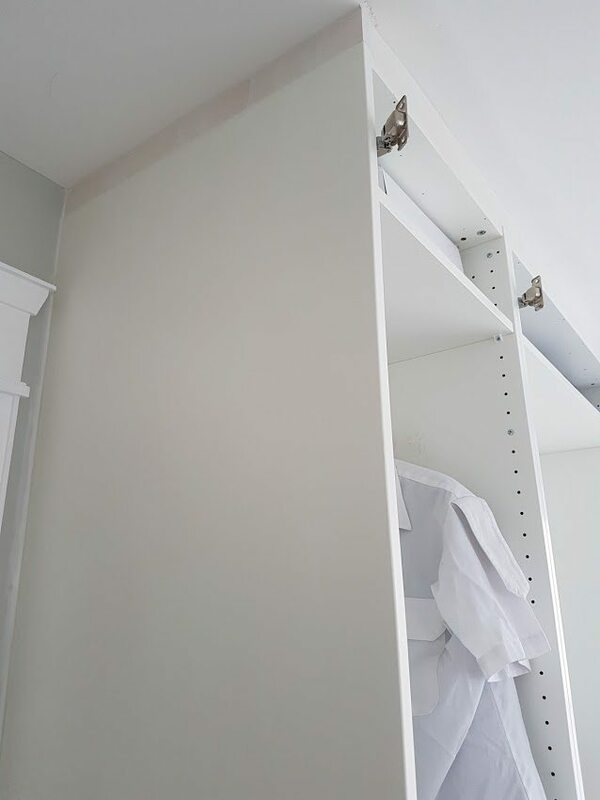 Then you want to measure and cut out pieces of wood that will fill the gap between the top of the wardrobe and the ceiling. You may also need to do this along the side, if you have a gap there too. These pieces are going to act as a brace for you to drywall against. You can see the piece of wood on top of the wardrobe here that we were measuring out. You want to set it back slightly because you are going to place drywall on top of it. Once we had done that, and the Pax was set back in the corner, we used both construction adhesive and a nail gun to affix the wood pieces to the ceiling and Pax. Now with your wood pieces in place, you cut your drywall to size and use drywall tape and compound (ie. “mud”) to make a smooth, seamless transition from Pax wardrobe to ceiling or wall. Drywalling is a bit finicky, but you’ll get the hang of it. Because you sand it down between each coat of mudding, you can smooth out any lumpy parts. Look up some videos on YouTube on how to drywall, if you haven’t done it before. I didn’t get any pics of this process, as I was away while Dan tackled it! You need to mud, let dry, and sand at least twice to get a good smooth finish. You also need to caulk any remaining seams so that all gaps disappear. Use Dap caulking for this (it’s our fave brand). You caulk along the seam, then wipe away excess with your finger with a long pulling motion across the seam. It’s actually a rewarding job as you suddenly get a smooth looking line. Once everything has dried and drywall has been sanded down to ensure a smooth finish, it’s time to paint. The first thing about painting the IKEA Pax wardrobe, or really any piece of IKEA furniture, is that you NEED this primer. It is the magic piece of the puzzle. It’s the Zinsser shellac-based primer. Basically what it does it adheres to that glossy finish laminate really well. It dries with a matte finish, which is perfect for then applying whatever top coat paint you want. The Zinsser primer goes on very easily, it’s quite liquid-y compared to most paints, and it dries almost instantly. 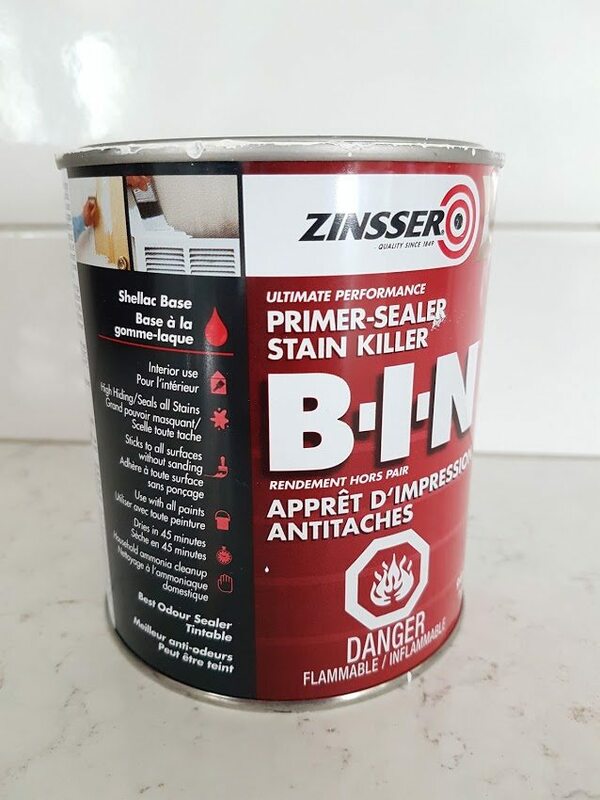 Make sure you get everything coated in this stuff as using regular latex paint straight on your wardrobe is going to mean chips down the road. Because I wanted the finish on the wardrobe to be perfect, I used the best tools out there: a Purdy paint brush for the nooks and crannies, and a Purdy microfibre roller. The roller was hands-down the best I have EVER used (and I have done a LOT of painting). Definitely splurge on this guy – it’s worth it. After one coat of primer, I did two coats of my top coat. For my top coat, I used a semi-gloss from Para Paints in the same colour as the walls – “Blenheim Palace”. I wanted the wardrobe to look completely built in, so having it be seamless with the walls was key. I painted the doors laid out on two sawhorses to ensure that there weren’t any drips. I gave them a good 24 hours to let completely dry and cure before bringing them back into the room. Another thing we did to really take the Pax wardrobe to the next level was to switch out the hardware. 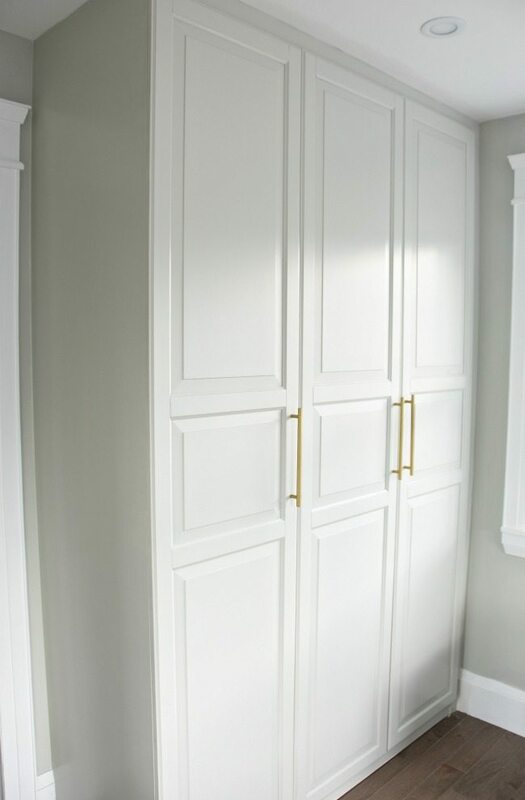 We used long gold hardware pulls that reflect a few other gold elements in the room and look amazing with the light green-gray paint. Doesn’t it all look so much better now? Way more intentional and seamless within the room. Alright and we’re finished with the IKEA Pax Hack! That was the last big piece of the puzzle for this room. Now I’m accessorizing and getting it ready for the big reveal! Come on back to see the full before and after’s of this master bedroom makeover next week. Don’t forget to check out all the other makeovers that are happening as part of the One Room Challenge! 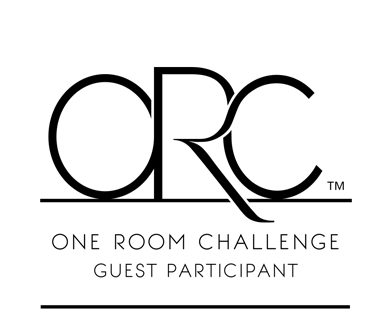 Our One Room Challenge has been sponsored by Wayfair. Wow what a difference. 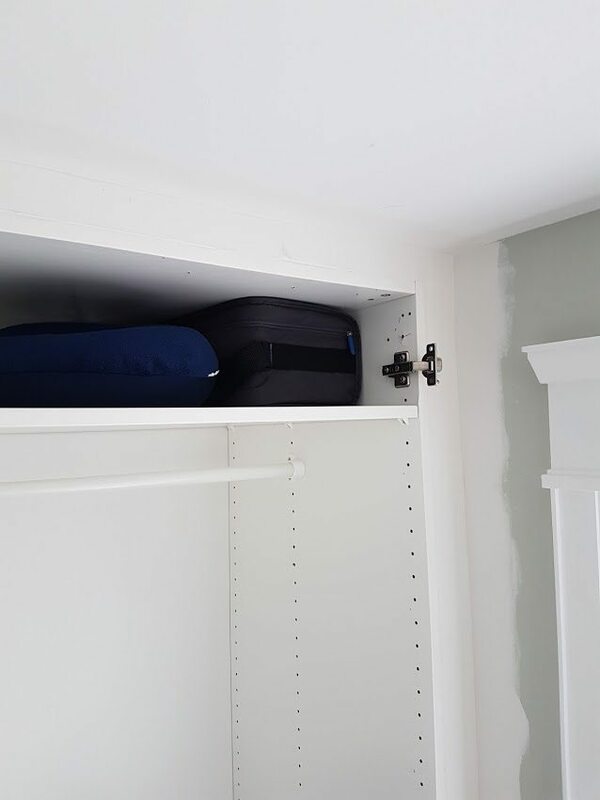 The closet does look seamless now. Great job and good luck with the accessorizing. Almost done! Thanks so much Jessica! It’s so much better, hey? What did you do to the doors to make them look like that? What did you do with the air duct? Never mind, I see it coming out of the bottom of the cabinet! It looks like you left steps out of the project. What did you do with the vent that was behind the cabinet and it looks like there was a light above it. 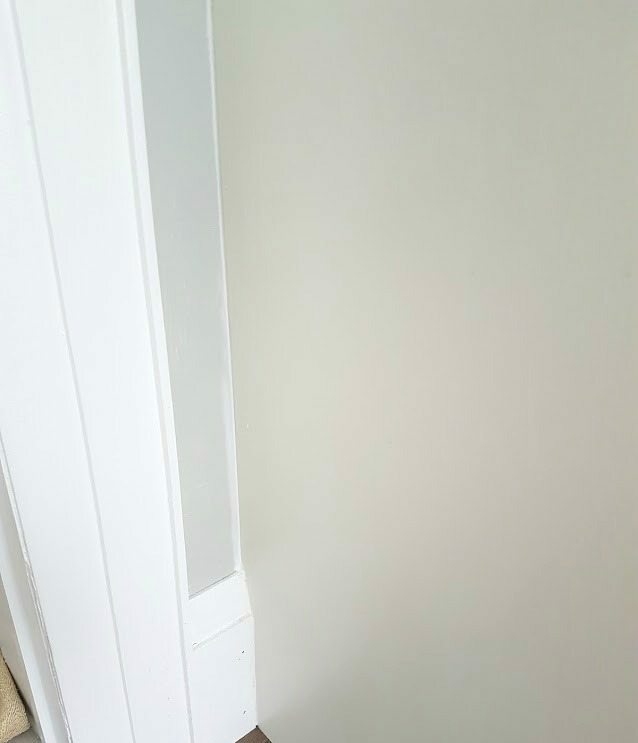 Do you know of good tutorials on YouTube on how to drywall the gaps ? I tried looking but there are so many and I am a complete newbie! 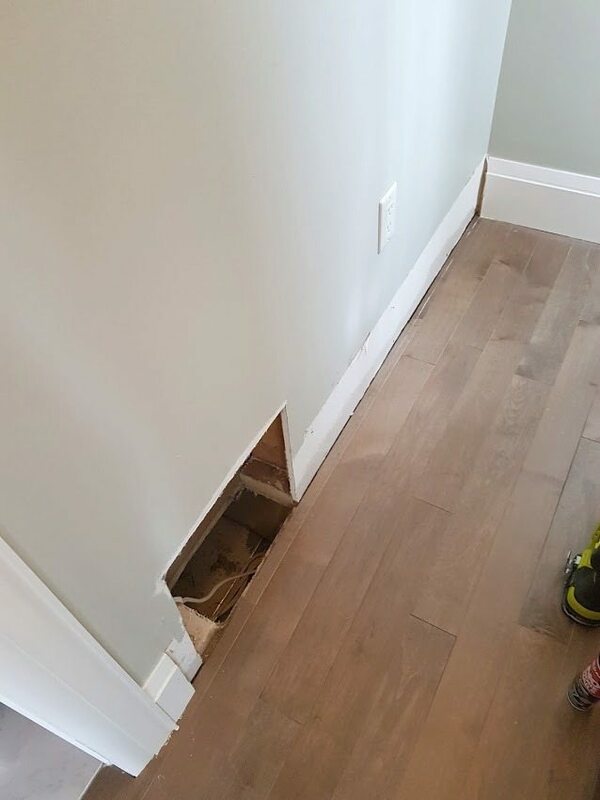 So did you actually cut small strips of drywall for the top and side (vs just mudding over the wooden insert/support, I guess)? Thanks! Omg what an amazing job you did, it was great following your project thank you….what did the whole thing cost start to finish? Love how this turned out! Question: did you paint the inside of your Pax (to match the walls)? And if not, did you paint the outside edge of the frame at all? Thanks!!! 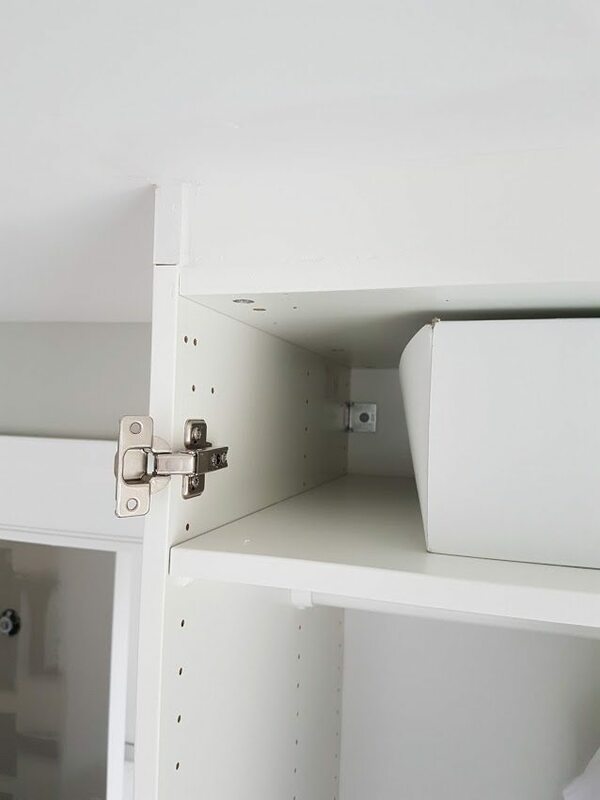 Hey – can I ask why you painted the cupboards and if it was needed? 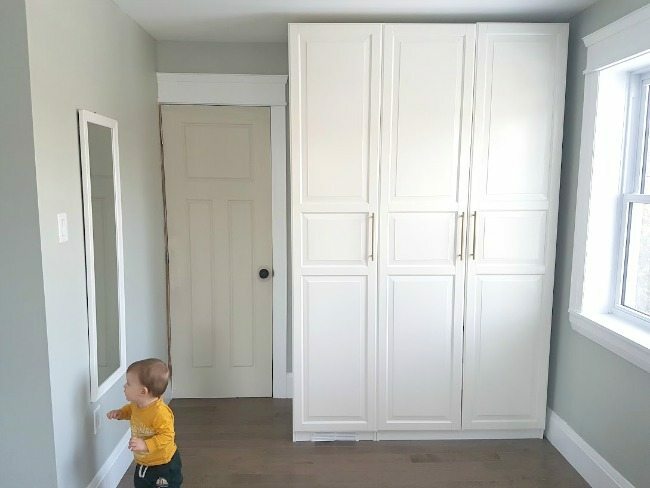 I want to do something similar in our walk in wardrobe. But the doors we have picked are Matt white in colour and look great already. Was it the ensure a seemless colour to where you had dry Walled or just a preference of colour? I just don’t fancy taking on a full repaint of the wardrobes! !